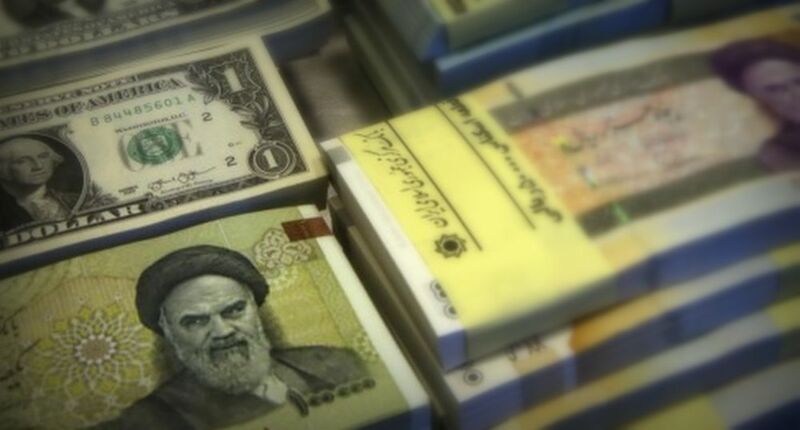 Iran’s national currency, the rial, lost some 20% against the American dollar in the last two weeks as Iranians rushed to hedge against depreciation of their assets, an only way to secure their investments. Some fear an imminent collapse of the nuclear deal and return of economic sanctions. While the International Atomic Energy Agency (IAEA) has verified Iran's compliance, United States (U.S.) President Trump continues to call for more sanctions on the Islamic Republic. But, if the deal collapses, unilateral U.S. sanctions against Iran's energy and banking sectors could return. This year alone, the Iranian rial has lost one-third of its value. The currency is now 60,000 to the dollar on the unregulated market; when Iranian President Hassan Rouhani took power in 2013 a dollar bought 36,000 Iranian rials. The rial has also hit record lows against the euro. One euro fetched 70,000 Iranian rials by the end of Sunday trading, ISNA reported, citing traders. According to the Iranian Economist Farshad Momeni, the Rouhani administration is manipulating the foreign exchange market to benefit from the arbitrage between the official and free market rates in order to compensate for its budget deficit. According to other policy experts, the Joint Comprehensive Plan of Action (JCPOA) may not survive past May 2018, with President Trump demanding European allies and Congress alter it, due to which Iran’s financial markets are reacting nervously to the reports. The JCPOA, enacted in 2015 by Iran, the five permanent members of the United Nations Security Council and Germany, allowed the lifting of international sanctions on Iran in exchange for compliance with restrictions on its nuclear program. The value of the rial started to drop in recent days as investors fear that the U.S may leave the nuclear deal and impose new sanctions on their country. The devaluation has been essentially continuous since the country's 1979 Islamic Revolution when one dollar bought 70 Iranian rials. The Central Bank of Iran (CBI) has allowed the rial to depreciate gradually to compensate for Iran’s high inflation and to help to make exports more competitive. In the year 1998, in order to ease pressure on exporters, the CBI introduced a currency certificate system allowing exporters to trade certificates for hard currency on the Tehran Stock Exchange, thus creating a floating value for the rial known as the "TSE rate" or "market rate". This method finally replaced the fixed "export rate" (3,000 Iranian rials for US$1) in March 2000 and has since held steady at some 8,500 Iranian rials for US$1. In March 2002, the multi-tiered system was replaced by a unified, market-driven exchange rate. In 2002 the "official rate" a.k.a. "preferred rate" (1,752 Iranian rials for US$1) was abolished, and the TSE rate became the basis for the new unified foreign-exchange regime. Until 2002, Iran's exchange rate system was based on a multi-layered system, where state and para-state enterprises benefited from the "preferred or official rate" (1,750 Iranian rials for US$1) while the private sector had to pay the "market rate" (8,000 Iranian rials for US$1), hence creating an unequal competition environment. The "official rate" of the Iranian rial—1,750 per U.S. dollar—applied to oil and gas export receipts, imports of essential goods and services, and repayment of external debt. The "export rate", fixed at 3,000 Iranian rials per dollar since May 1995, applied to all other trade transactions, but mainly to capital goods imports of public enterprises. In the year 2010, Iran started giving away the subsidies associated with the fuel (incl. from heating oil to engine petrol), which amounted to US$4,000 per year for the average Iranian family of four according to the International Monetary Fund (IMF). This was considered as a sign of normalization of its economy and at the same time, the country began introducing a privatization program to reduce the footprints of the state. That effort, economists say, stalled since it clashed with Iran's isolation from the global economy due to the pursuit of its nuclear development plan. In the year 2012, economist Steve Hanke, Professor of Applied Economics, at Johns Hopkins University and a Senior Fellow at the Cato Institute in Washington, D.C. has clearly stated that the Islamic Republic is the first country in the Middle East to ever have hyperinflation -- defined as an economy seeing its monthly inflation rate soar 50% or more each month. When President Obama signed the Comprehensive Iran Sanctions, Accountability, and Divestment Act (CISADA), in July 2010, the official Iranian rial-U.S. dollar exchange rate was very close to the black-market rate. CISADA extended American economic sanctions placed on Iran under the Iran Sanctions Act of 1996 (The act was previously known as The Iran and Libya Sanctions Act of 1996 (ILSA). On September 30, 2006, the act was renamed to the Iran Sanctions Act (ISA), as it no longer applied to Libya, and extended until December 31, 2011) and punishes companies and individuals who aid Iran's petroleum sector. This increased pressure is part of the larger campaign over the Iranian nuclear program and aims to target Iranian dependence on imports for its gasoline needs. The act was passed by the House (408–8) and Senate (99–0) on June 24, 2010, and signed into law by President Obama on July 1, 2010. 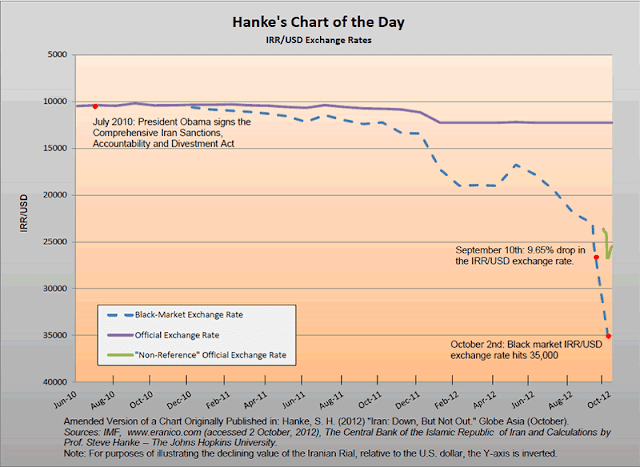 But, as the accompanying chart shows, the official and black market rates have increasingly diverged since July 2010. Indeed, while the rest of the world watched Iran’s economy briefly slip into hyperinflation in October of 2012, the Statistical Centre of Iran (SCI) and CBI both defiantly reported only mild upticks in inflation. As per the latest figures, Iran’s current balance of trade (BoT) is actually looking quite healthy. There are $50 billion of oil exports and $40 billion of non-oil exports. The country imports $50 billion worth of goods and services every year. But, the problem lies in bringing the revenue earned via export-based foreign exchange into Iran. Even though international sanctions were lifted after the signing of the nuclear deal, Iran has not been able to attract any major international banks to the country. Many experts believe the uncertainty over the fate of the nuclear deal, is among the prime reasons behind the collapse of the rial. Chart Attribute: Iran’s balance of trade (BoT) - Jan 2015- July 2017 / Source: TradingEconomics.com / Central Bank of Iran (CBI). President Trump sees three defects in the JCPOA: a failure to address Iran’s ballistic missile program; the terms under which international inspectors can visit suspect Iranian nuclear sites; and "sunset" clauses under which limits on the Iranian nuclear program start to expire after 10 years. Trump wants all three strengthened if the U.S is to stay in the deal. In December 2017, EU's Foreign Policy Chief Federica Mogherini quoted on President Trump's decision not to certify Iran's compliance — "This deal (JCPOA) is not a bilateral agreement, this is not an international treaty," but part of a U.N. Security Council Resolution, she said tersely after the announcement, "so it is clearly not in the hands of any president of any country in the world to terminate an agreement of this sort.". Later President Trump waived sanctions on Iran in mid-January (2018) as part of the 2015 nuclear pact, but pledged that this time it was the country's "last chance". But, he has also set a May 12, 2018, deadline to either improve or scrap the accord, which was negotiated under his predecessor Barack Obama. On April 11, 2018, U.S. Treasury Secretary Steven Mnuchin has signaled that the U.S may impose "very strong" sanctions on Iran, testifying before a House Appropriations Subcommittee. The measures would include sanctions against both Iran and entities that do business with the country. At the same time, most Democrats and some Republicans, including members of Trump’s national security team, have expressed concerns about pulling out of the accord or taking any action against Iran, saying it could hurt U.S. credibility on the world stage. The country can’t boost oil production without investment, and can't attract investment with looming new sanctions. In 2016, Iran had failed to attract investment due to low oil prices despite signing the JCPOA. And, with Iran’s national currency recently hit an all-time low, and economic uncertainty looks likely to test the country’s political establishment. U.S. Congress has so far refused to take up the new Iranian sanctions into legislation and at the same time, EU fears that any new initiative leading to the amendment of JCPOA, could create a rift between Europe and the U.S. and freeze the huge ongoing European investment in Iran. The west is also facing a dilemma in Lebanon, Syria, and Iraq today. The current Syrian crisis and defeat of Islamic state have created a vacuum which is being filled by Iran. It's therefore quite doubtful that President Trump will find partners among the agreement's signatories to realize his demands and also he faces a slew of unappetizing choices in Syria, which now includes Israel after the audacious air strike by the latter.